It must not have "cleared its neighbourhood" of other bodies. It must not be a moon. 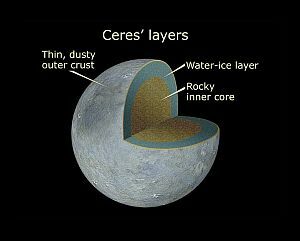 Under these criteria, there are currently five officially designated: Ceres, Pluto, Haumea, Makemake and Eris. Of these, Ceres is the only one orbiting within the inner solar system, being the largest of the asteroids. The other four are all trans-Neptunian objects, that is, they all orbit further out than that planet. In deference to Pluto's special place in the solar system, having once been classed as a planet, these four are also known as "plutoids", or "plutinos". This dwarf planet orbits within the asteroid belt, between the orbits of Mars and Jupiter and, with a diameter of 590 miles, is the smallest of the five. It lies 257,055,424 miles out from the Sun, which it orbits in 4.6 years. Spectral analysis of the dwarf planet reveals a surface of hydrated material, such as clay, indicating the presence of water beneath the crust, together with traces of the minerals dolomite and siderite. Actual observation has uncovered several features that may be craters. It is thought that Ceres possesses a large, rocky core, beneath a layer of water-ice, covered by a thin crust. This presence of water-ice has led to speculation that the dwarf planet may harbour some sort of life. This is obviously the most famous dwarf planet, having, for many years, been considered an actual fully-fledged planet. 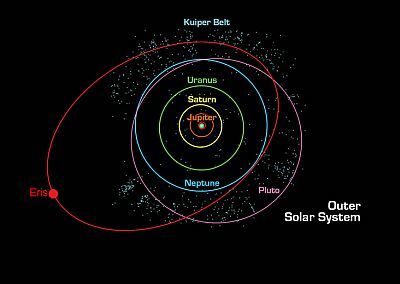 Pluto orbits within the Kuiper Belt, so has not "cleared its neighbourhood", which agrees with rule three laid down by the IAU. 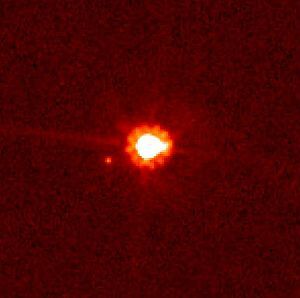 For many years, this was the best image available of the dwarf planet, as it lies an impressive 3,649,934,383 miles out from the Sun, which it orbits in 247.68 years. With a diameter of 1,433 miles, it is not even the largest dwarf planet (that title goes to Eris). One day on Pluto is equivalent to 6.39 Earth days and, like the planet Uranus, it rotates on its side. Then, in July, 2015, after a journey of over nine years, the NASA probe New Horizons reached Pluto, affording us this breathtaking close-up image of the dwarf planet. It was found to have ice flows and an atmosphere. 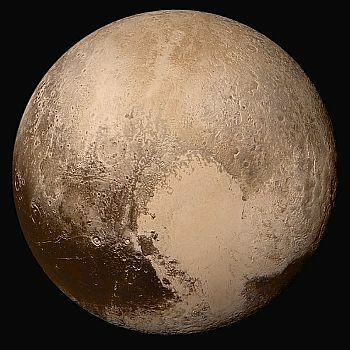 Spectral analysis by the Hubble Space Telescope suggests that Pluto is differentiated into core, mantle and crust. It is hypothesised to have a rocky core (3) with a radius of 530 miles (around two-thirds of the total radius). Above that is a thick mantle of water-ice (2), topped of with a thin crust of frozen nitrogen, with traces of methane and carbon dioxide (1). The surface displays pronounced contrast in colour and brightness - areas of black, dark orange and white. 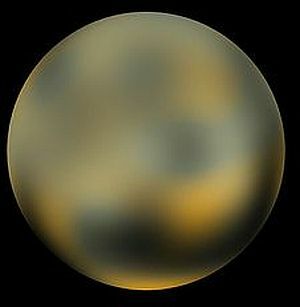 Pluto, overall, has a reddish hue. Pluto has five known moons, which all orbit very close to it. The fourth and fifth were only discovered in 2011 and 2012. This image, taken by Hubble, shows the other three. As you can see, one is far larger than the others. Charon is Pluto's main moon and by far the largest, accounting for around 99% of the total mass of the five-moon system. It has a diameter of 750 miles and lies a mere 12,000 miles from its neighbour, which it orbits in just under 6.5 days. Its surface has been shown to consist of less volatile water-ice than Pluto and evidence of cryo-geysers has been detected. Here is another fine image, courtesy of New Horizons, showing the dwarf planet with its largest moon. 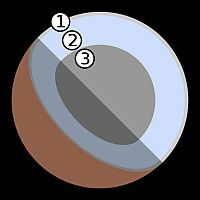 The fact that the barycenter lies in the empty space between them fulfills the criterion required for a binary system, so it has been proposed that Pluto/Charon is just that. 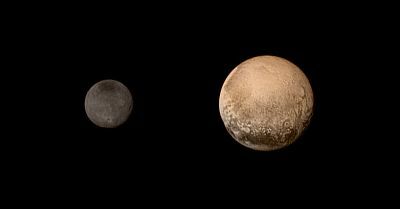 This would mean that, rather than being a moon of Pluto, Charon would be another dwarf planet. The IAU has yet to comment on the matter. Charon had been discovered as far back as 1978 and it wasn't until the early 21st century that any more were observed. 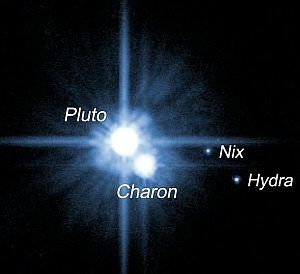 In 2005, two new moons were added to Pluto's family. The 120 mile diameter Nix lies 30,266 miles out from Pluto, which it orbits in just under 25 days. Information on these other four moons is sketchy. It was first thought that Nix had a reddish tint, like Pluto, but further observations have discounted this. A bit further out, at 40,233 miles is Hydra. With a diameter of just over 42 miles, it orbits Pluto in 38.2 days. In 2011, a fourth moon was discovered. Kerberos is a mere 14.5 miles in diameter, it orbits Pluto at a distance of 36,660 miles in 32.1 days. A year later, a fifth moon came to light. Styx is less than 11 miles in diameter. Its orbit takes 20 days at a distance of approximately 26,000 miles. 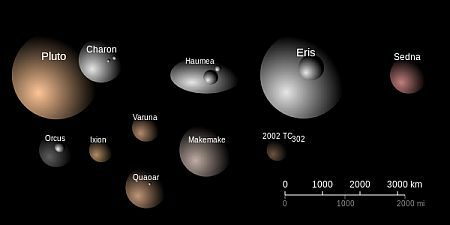 Haumea is found within the Kuiper Belt and is its third brightest object. It is also one of the weirdest objects in the solar system, as it is shaped like a rugby ball! This facet of the dwarf planet is looked at in detail here. When you consider that the IAU's second criterion for dwarf planet status is that it must be roughly spherical, you might be thinking that rugby-ball-shape is stretching things a bit (no pun). In fact, Haumea is thought to have the "hydrostatic equilibrium" that would normally create the spherical shape. The elongation is due to its speed of rotation. Haumea is the fastest spinning object in the solar system; one of its days lasts a mere four hours. Haumea is, on average, 4,009,369,860 miles out from the Sun, which it orbits in 283.28 years. Its length is 1218 miles, its width being 943. Studying the speed of Haumea's rotation can indicate what it's made of and the consensus is that it is mostly rock, covered with a thin layer of ice. This ice is crystalline in nature, similar to that covering Pluto's moon, Charon. This is puzzling, because that type of ice only forms at temperatures above 110K, whereas, Haumea has a surface temperature no higher than 50K. It would seem to indicate that the dwarf planet has undergone recent resurfacing, but how, why and when is a mystery. 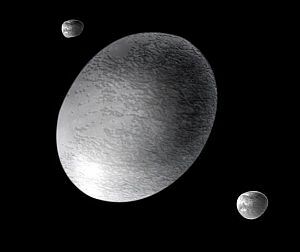 Haumea has two tiny moons, both discovered in 2005. The larger of the two is Hi'iaka, lying 31,000 miles out. It has an average diameter of 121 miles and orbits Haumea in about 49 days. Then there is Namaka, orbiting in 18 days, 16,000 miles out. It averages 53 miles in diameter. 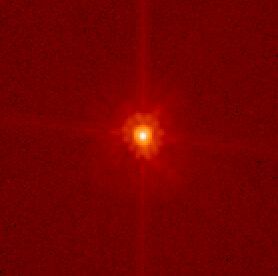 Makemake is the second brightest Kuiper Belt Object (after Pluto). Unusually for a large member of this belt, it has no known moons. The 888-mile-diameter Makemake lies 4,256,539,351 miles out from the Sun, which it orbits in 310 years. Spectral analysis of its surface has shown a high presence of frozen methane and there may be amounts of ethane and tholins, too. It has also been observed to be dotted with darker patches. The presence of tholins give Makemake a reddish tint. 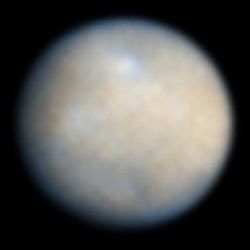 This is the largest dwarf planet. With a diameter of 1,445 miles, it just beats Pluto to the title. Photographed by Hubble, with its moon, Dysnomia to the left. Eris is found in an area of the solar system called the "scattered disc". All members of this disc have very eccentric orbits, meaning that they follow an elliptical path that brings them much closer to the Sun at one end of the orbit than the other. This diagram shows this quite neatly. Eris's distance from the Sun varies from 3,567,179,087 miles at its closest, to an impressive 9,077,134,537 miles at its furthest. One orbit takes 561 years. Because of its remoteness from Earth, observation of it has proved difficult. It is thought that Eris has a greyish hue and may have frozen methane on its surface. The one solitary moon of Eris has been christened Dysnomia. Its diameter is still under debate, with estimates varying between 60 and 300 miles. It follows a circular orbit round Eris at a distance of 23,208 miles. One such orbit takes nearly 16 days. Dysnomia is thought to have a significantly darker surface than its host dwarf planet.